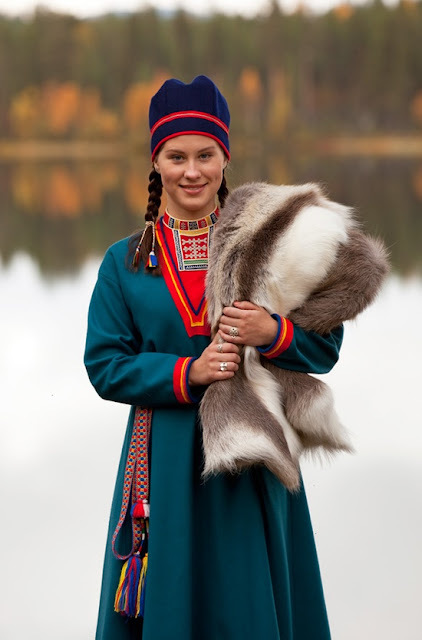 Today I will do an overview of the costumes of the Saami people. Previously they were called Lapps, but this is not what they call themselves, and they consider the term to be pejorative. The origin of the word Lapp is controverted, but it may be from Old Finnish/Estonian for a place far away. 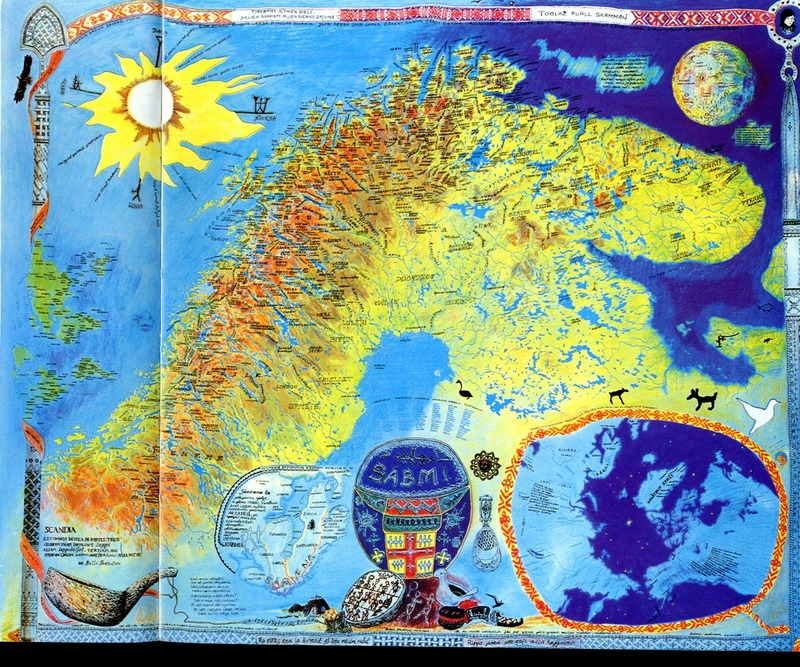 The Land of the Saami; Sápmi, Sábme, or Saemie, depending on the Dialect, is split between four nation-states, Norway, Sweden, Finland, and Russia. It consists of the northern part of the Fenno-Scandian peninsula. 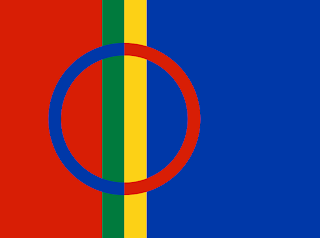 The Saami do not have political recognition as a people, but they do have a flag. 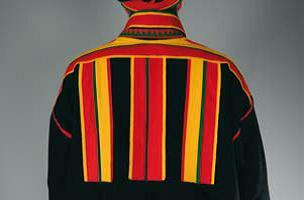 The colors of the flag are the same colors used in Saami costume, for the most part. 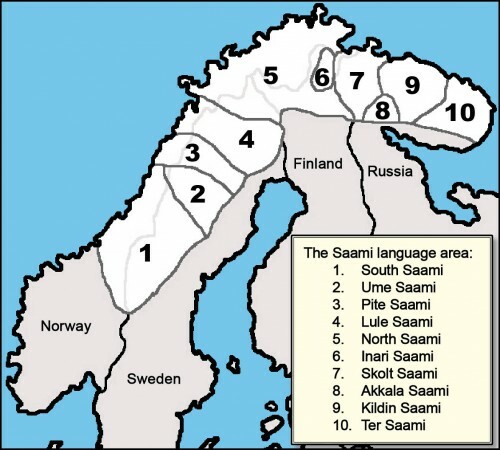 Linguists group the various Saami dialects into 9 Languages, of which 3 are moribund. These languages are completely unrelated to Norwegian, Swedish or Russian, and only distantly related to Finnish. 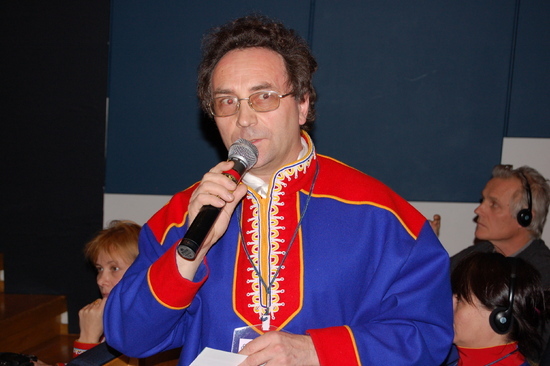 There are about 160,000 Saami worldwide, of which maybe 20,000 speak one of their native languages. In spite of this linguistic diversity, they do indeed think of themselves as one people, and recently have been very active politically. For more information see these articles. There are a large number of blogs and articles online as well. I will be following the linguistic groups in my discussion of the costumes. Here are two maps which show the different groups. The second one omits the three moribund languages, but has many useful place names. I will be referring to both groups and locations throughout the article. Saami languages were also once spoken much further south. 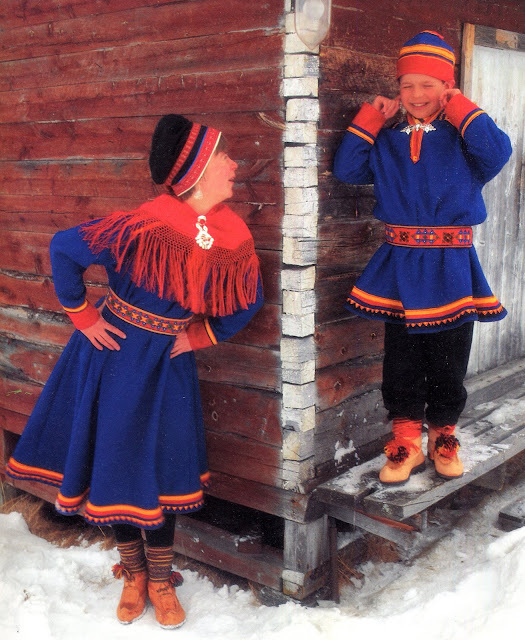 The term which the Saami use for their costume is Gákti. This has been borrowed into Norwegian as Kofte, into Swedish as Kolt, and into Finnish as Takki. There is no equivalent in Russian. 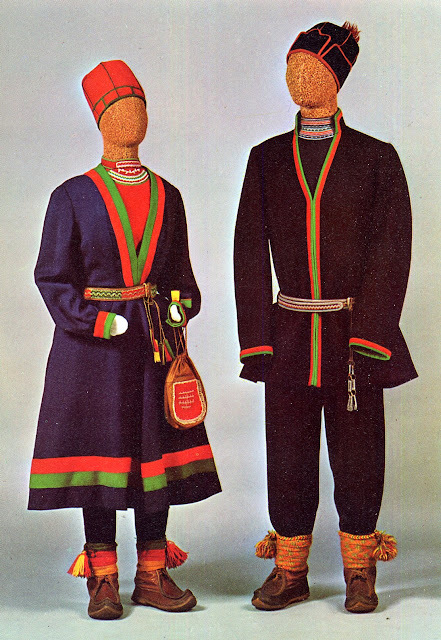 The couple at the head of the article are wearing the costume which is the most famous, from Kautokeino (Guovdageaidnu) in Norway. [Throughout this article I will give the internationally recognized name of a location first, followed by the Saami name in parentheses.] 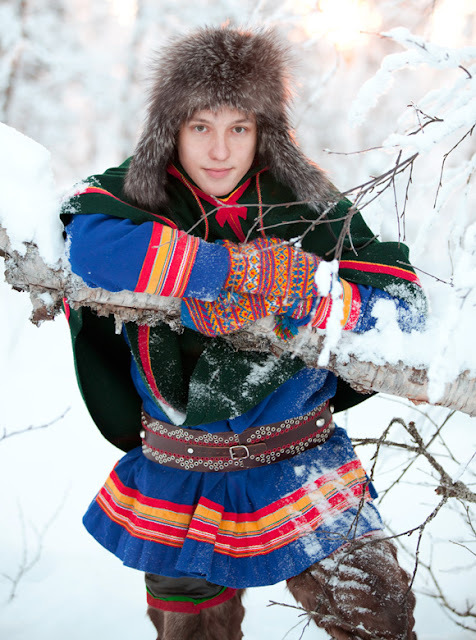 This is undoubtedly the poster child of the Saami group, being one of the most colorful and impressive. Most of the Gákti have the same basic construction, however. The main part of the costume consists of a pullover, which is basically the same for men and women, the mens' version hangs about mid thigh, while the womens' hangs to the knee or mid calf, depending on the local variation. The following drawings by Max Tilke show the basic cut. The first is a woman's garment from 'Tornelappmark', which is an old name for far northern Sweden. This is a man's garment, place of origin unspecified. 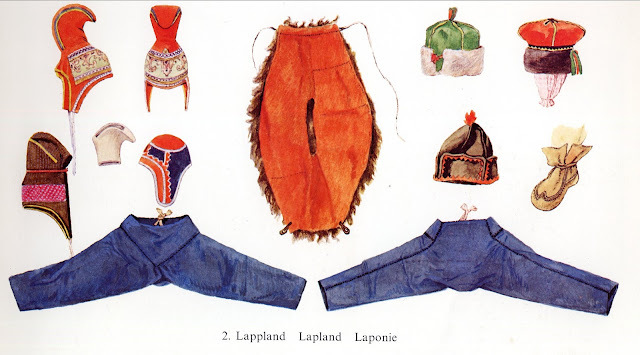 This shows a pair of pants and a variety of different hats and bonnets used by the Saami. The basic garment is belted with either a woven sash or leather strap, which may be variously ornamented. Men wear pants, and women also in cold weather; low boots with woven straps are worn, some of plain leather and others of reindeer fur. Reindeer fur leggings are worn in winter over the pants, these sometimes have 'wings' attached to the upper edge. Hats and bonnets vary greatly according to location. 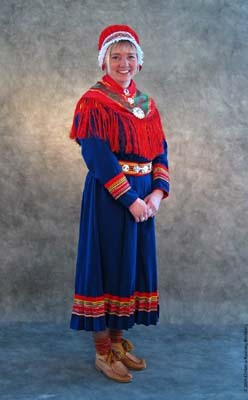 The basic color of the cloth is usually the blue of the Saami flag, but it may be black, off-white, or sometimes green. Garment pieces may also be of leather. The trim is almost always red and yellow, with some green added at times. Overgarments of reindeer fur are worn in winter. 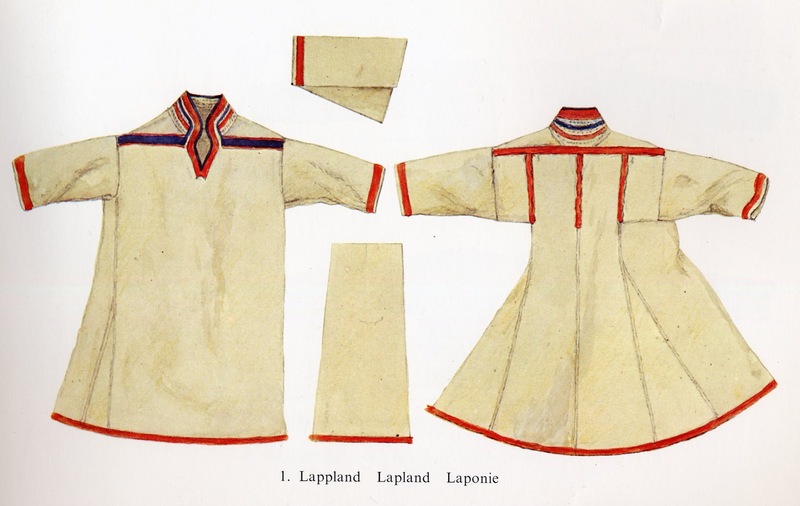 DMC has put out a book titled 'Lapland Embroideries', but NONE of the embroidery designs pictured in the book are Saami. 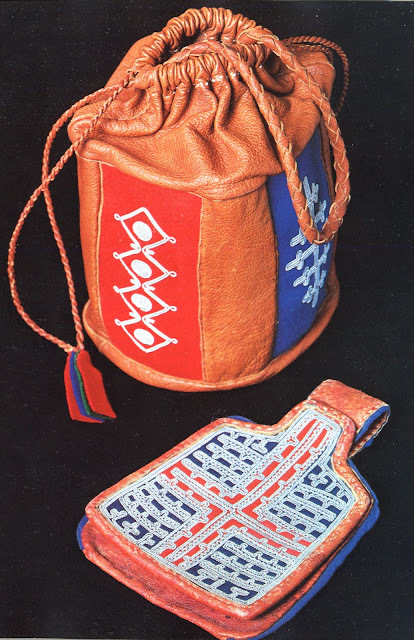 There are a couple of designs from the woven sashes on p. 40, but the rest of the designs are from various other northern peoples ranging from the Icelanders to the Nanai. 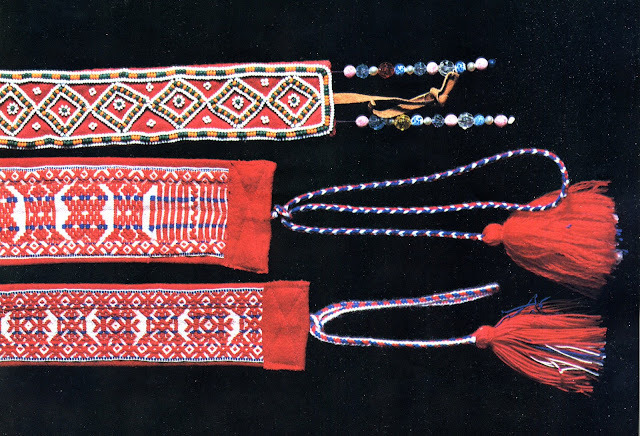 In the eastern parts of Sabme, beadwork is also done. In this image, the two woven sashes are Northern Saami from Enontekiö (Eanodat) in Finland, and the beaded one is Skolt Saami. I will now give short illustrations of the costumes of the various groups. This will by no means be exhaustive, as there are many regional types, and detailed information is difficult to find on some of them. Please refer to the above maps. 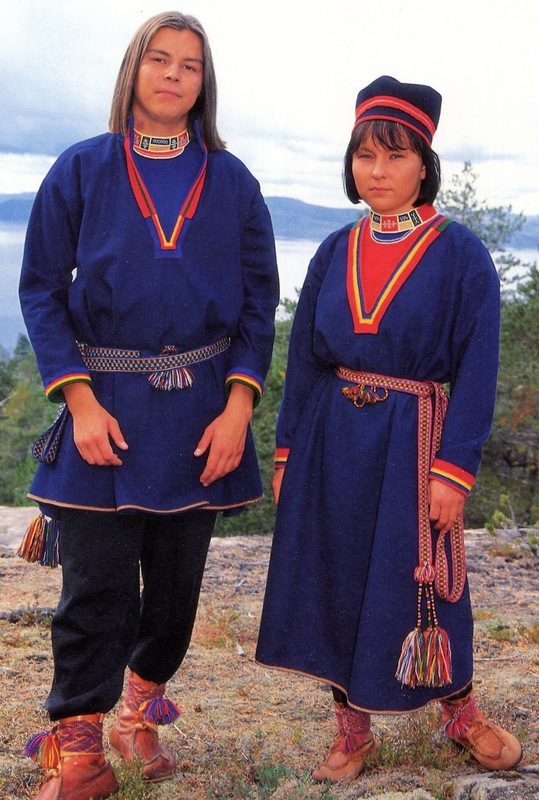 There are about 2000 South Saami, of whom perhaps 600 can speak the language. Here is the costume from between Femunden and Saltfjellet in Norway. A closeup of the dickey, pin, purse and belt of this costume. Notice the pewter wire couching. 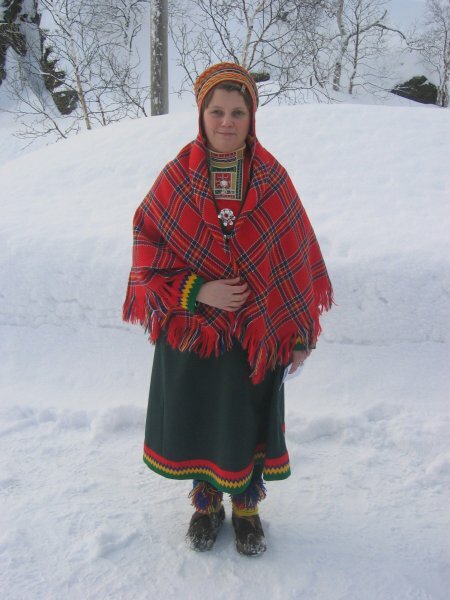 This costume is from around Idre in Dalarna, Sweden. This young man is also South Saami from Sweden, from around AmmarnäsTärnaby, VilhelminaÅsele. 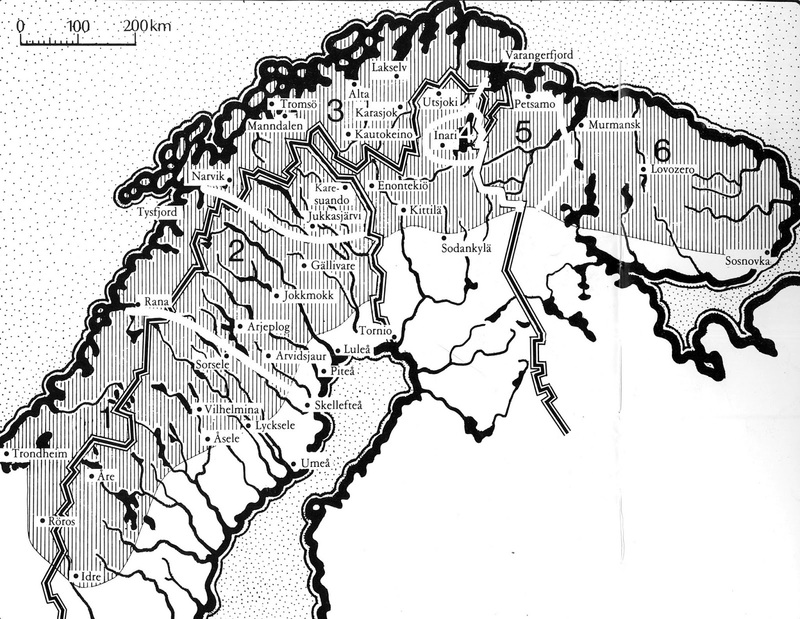 The central Saami traditionally spoke the Ume, Pite and Lule languages, going from south to north. Ume Saami currently has about 10 speakers, and Pite Saami has between 25 and 50. There are more who no longer speak the language. So many good sources of images do not bother to record the exact origin, so many of the images which I have are simply marked 'Sweden' or 'Norway'. I have not been able to find many images of these people. This is the only image which I have been able to find which is unequivocably Ume Saami. 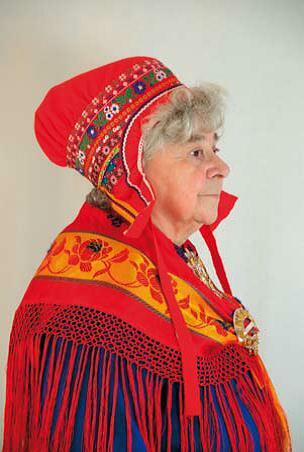 This woman is LenaMaria Nilsson who is active in Saami politics. 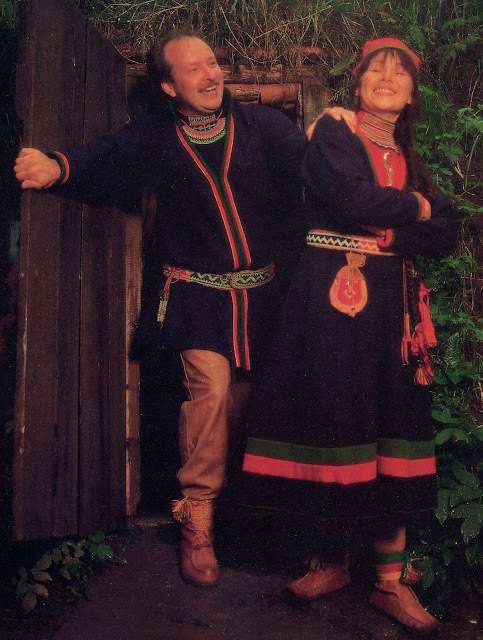 Lule Saami is still spoken by perhaps 2000 people, the second largest of the Saami languages. 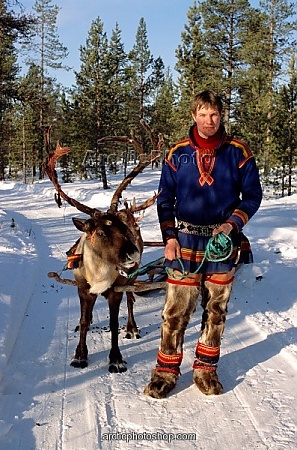 The Northern Saami are found in the northernmost parts of Norway, Sweden, and Finland. 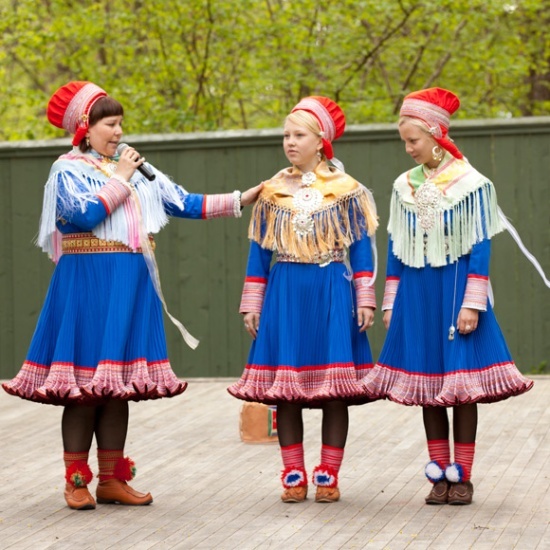 Theirs is the largest of the Saami languages at 15,000 or more speakers. There are districts where they are still the majority population. There are a dozen or more very colorful costumes worn by the Northern Saami I will highlight just a few. 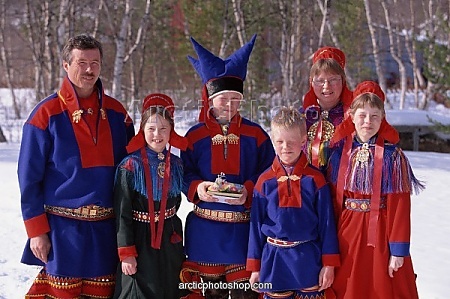 These are some of the Northern Saami costumes found in Norway. The same basic costume is also worn in Tana. You can see the 'wings' on the fur leggings on the man. 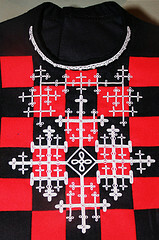 This is often described as 'embroidered', but in fact the ornamentation consists of rows of appliqued patterned ribbon. The Inari and Skolt languages are each highly divergent from the other Saami languages. About 300 people currently speak this language, although there is a movement to start teaching it to younger people. The Inari only live in Finland. 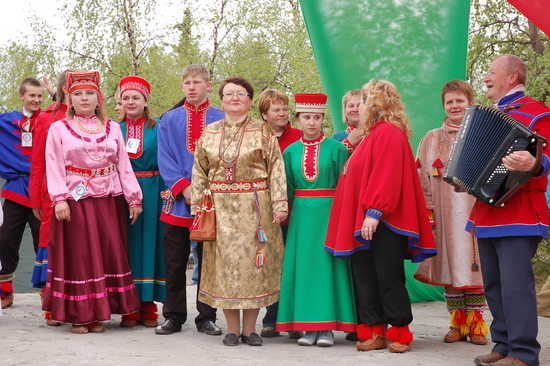 The Skolt Saami number about 1250 and live in Norway, Finland and Russia, although most of the 400 speakers of the language live in Finland. 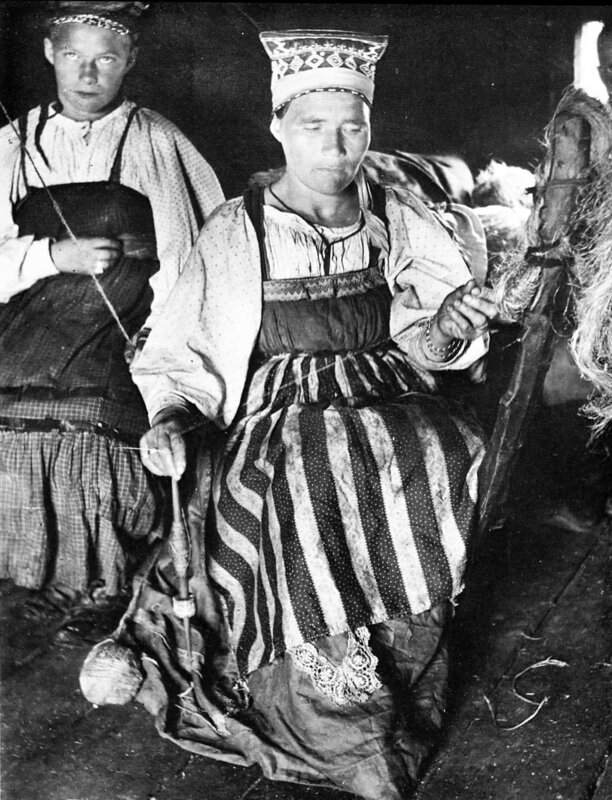 Some of them abandoned the Gáktii for chemise and Sarafan as worn by their neighbors, The Karelians and the White Sea Russians. 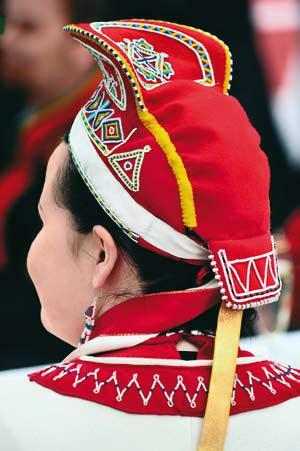 The women wear beaded caps which are similar to the Sorokka worn by the Karelians. These only live in Russia. Of the three languages, Akkala is extinct, and 2 people still speak Ter. 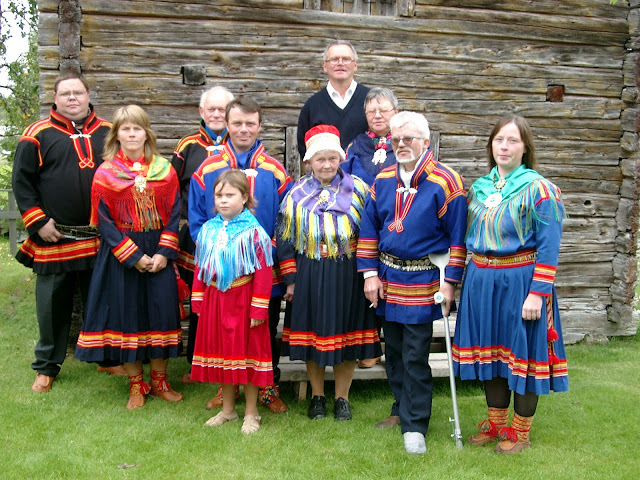 Kilden Saami is still spoken by perhaps 600 people. It is not used much in daily life, and most Saami in Russia do not speak it. I have found several images of Saami from Russia, but I do not have information as to which costume comes from which location. Some of these may be Skolt. 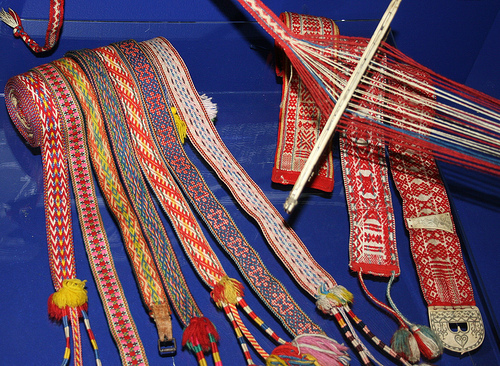 Here is one blog which is devoted to Saami culture. This is well worth looking over for more information and links. Thank you for reading. I hope that you have found this interesting. The circumstances in which the Saami find themselves, being split by political borders, having local ways of speaking which are unintelligible to other communities, having no common language of their own, Identity at best ignored or often suppressed by the governments of the majority people are not unique. They are unfortunately similar for many indigenous people around the world. Each culture is a unique treasure which in a sense belongs to humanity at large. We should at least be aware of them. I have pieced this article together from many sources, and while I have caught some obvious errors, there may be others which have found their way into this article. I am particularly unsure concerning the material from Sweden. If anyone, Saami or otherwise notices such errors, I apologize and would greatly appreciate better information and images. Thank you. I found your information while doing research for my book. I, also, do hand work but it is no where near the complexity of what you do. The costumes are magnificent. I have a friend who does fancy dancing costumes for her husband who is from the Black Foot tribe in Washington state. It is so upsetting when indigenous people are misused by those in control of a country - state - county - city. I hope the problems of the Salamis will be eased through your good work. As we say in the western U.S.: via con Dios. I sincerely hope that 'Salamis' was just a typo. Most of the costumes and embroidery on my blog are not my work. I try to clearly label my work when I post it. I would love to do a piece on fancy dance outfits, but I do not know how much information is in print. I saw an article in National Geographic a few years ago which featured fancy dance costumes, but all the photography was sepia-toned. A VERY bad choice on someone's part. Why take away the color? this is a living tradition, and not Museum photos taken when the technology was more primitive. Hi, I would like to point out that the Sami are in fact recognized politically as a people. 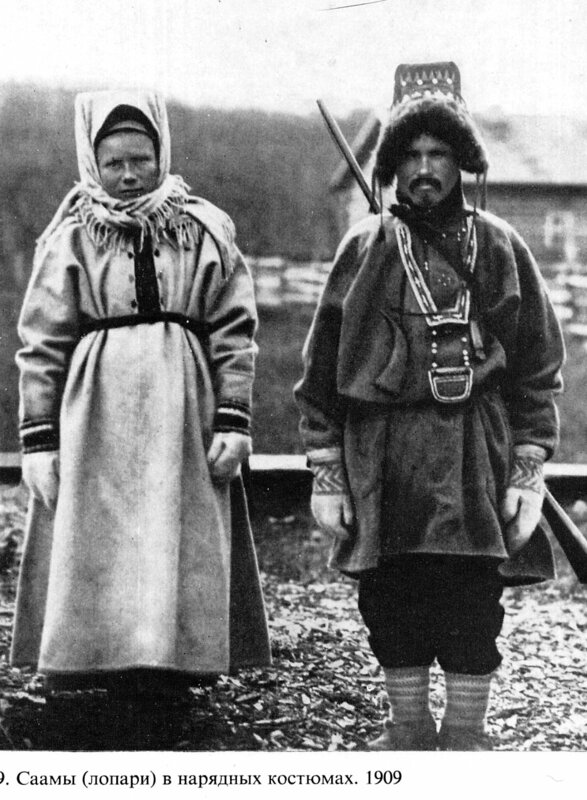 Search Sami people on wikipedia. Also, you have a nice blog with a good collection of the various costumes, keep up the good work! Where would I find patterns for the men's tunics? I would like to make a tunic for my husband. Hello Ruadhaine, I included one pattern for a man's tunic in the article, the sixth image. There is some variation, especially from region to region. Just figure out how big it needs to be. All the pieces are rectangles, triangles and trapezoids. Just remember that the 'shoulder' seam does not fall on the point of the shoulder. You can see from the images where the seam is, at the end of the colored panels on the shoulders. Also remember that it fits loosely, and should be full. A person with experience sewing should be able to put one together. If you are talking about the type of pattern with pieces of paper that you cut out, I am not at all sure that such a thing exists. I do not know if any do Saami clothing tho. if you write me directly at the email above, rkozakand@aol.com I could give you more details. I say go ahead, choose one type of gakti and make it. you don't need paper patterns for this. That image comes from Max Tilke : Oriental Costumes, Their Designs and Colors, unfortunately my copy is buried in my office right now so I can't give you plate number or page. I do believe the source garment was in a collection in the Berlin Ethnographic Museum - http://www.smb.museum/en/museums-and-institutions/ethnologisches-museum/home.html - you might try there to see if it is still extant [ many German Museum collections were destroyed or 'strayed off' during WW2 ] This Society for Creative Anachronism Pinterest site specializes in 'viking' clothing, and perhaps some of the links will be helpful [at least in unpatterned clothing construction.] http://www.pinterest.com/source/urd.priv.no/ I might also suggest that you consider getting in touch with your local SCA group and see what resources they might have, we cover all era interests prior to 1600 and just because you live in Holland doesn't mean that is the only culture someone there is interested in [I knew a man in Italy that was into Aztec stuff and was recreating an aztec named Ix ] I am here researching because my husband was interested in perhaps adopting a Saami personality to reenact. Adopting a Sámi personality to re-enact? How absolutely revolting and ignorant! Re-enacting a member of a living culture is completely different than portraying a medieval knight or a viking. Those are from times and cultures that have evolved into something else and no longer represent a real, living people any longer. 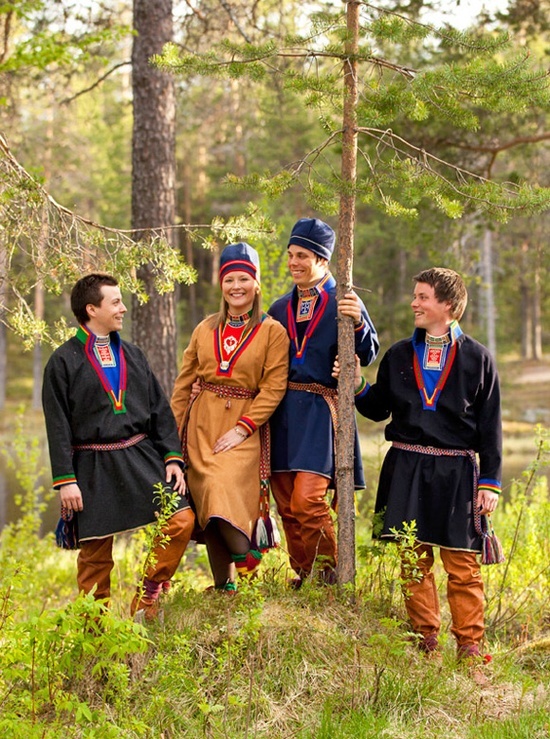 We, Sámi people, are real living beings, and you, your husband, whomever, have no right to pretend to know anything about what it means to be Sámi. Our history is filled with the governments of the settler cultures of Scandinavia trying to stifle, repress or eradicate our culture and identity, and we have had to fight hard, and even today the fight continues, for the right to exist. So, how dare you! 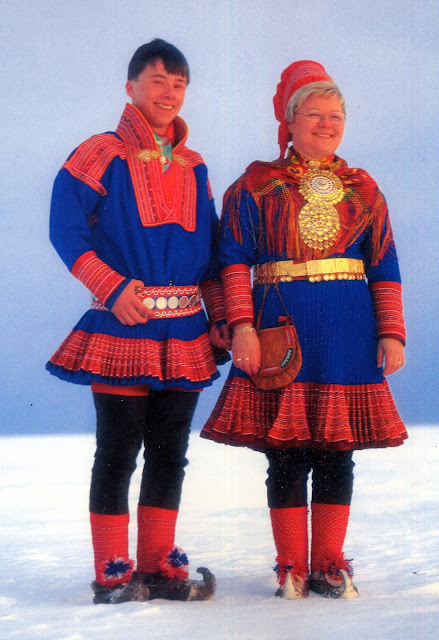 As a further note, because there are other people asking for gakti patterns so they can make their own; a gakti is a visual representation of who YOU (as a Sámi) are in your Sámi community. It is something exclusively personal that denotes your social standing and represents your cultural origins. It's not a costume to dress up in for fun, or a conversation piece to collect. It's not for you, and never will be. The fact that people are asking for patterns to copy would suggest that none of them were able to process the reasons for differentiation based on geography which this article has shown. Read it again and process what you have read and re-evaluate your asinine requests. Bravo! People need to stop hijacking first nations identities! These are living people! Show some respect! Exactly. Cultural appropriation is highly offensive. I cant speak for other indigenous people, but we Sami does NOT like it when non-samis dress up in our clothes or imitate our songs. 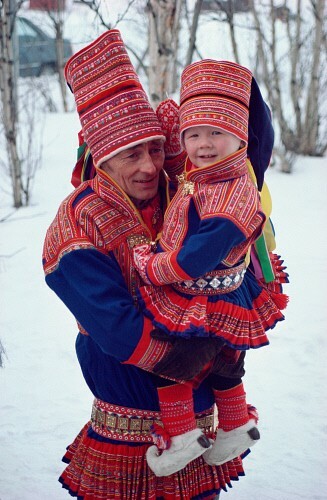 That being said, if you visit sapmi, and get to know us, especially if you make the effort to learn our language and customs, we would "adopt" you in a second. 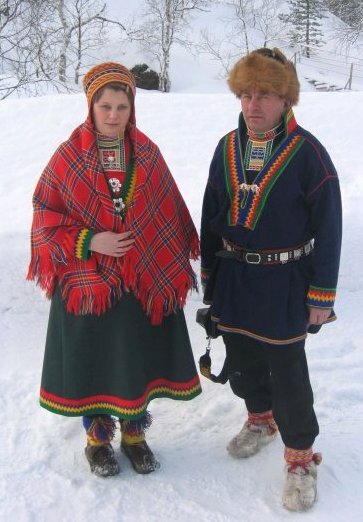 The only proper way a non-sami can wear sami clothing, is if that person marries into a sami family/clan, or are gifted the clothes/crafts from a sami person. Being giftet Duodji is a sign of respect and a way of honoring someone. It is hand-made the traditional way, is labor-intensive and requires a lot of skill (and hard work!). If a non-sami person comes to sapmi, learn how to make duodji properly, and then makes her (duodji is traditionally womens work) own gakti, it would probably be accepted IN THAT COMMUNITY. 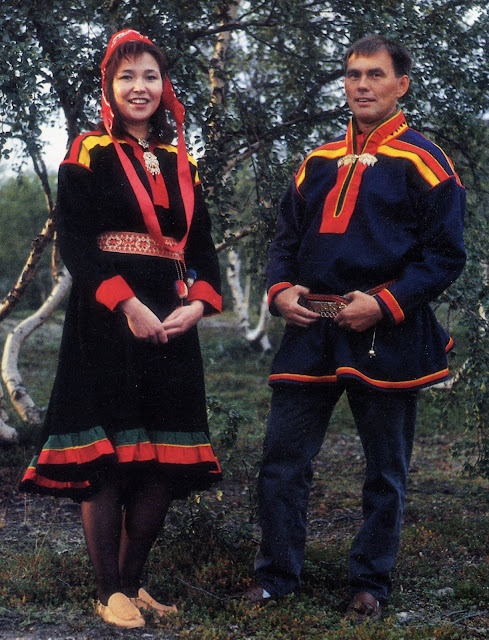 If that person wore her gakti somewhere else, it would not be well-recieved, unless she were properly introduced by a sami who vouched for her respect of our people. I came upon your website because I am also searching for a male Sami Sewing pattern. I live myself in the Netherlands and a couple off years ago I bought some original Sami fabrics when I was on holiday there. They could not provide me with a wewing pattern. We try to visit Laplans every 2 years. We just love it. Please do not make or wear a gakti if you're not sami. It is highly offensive. 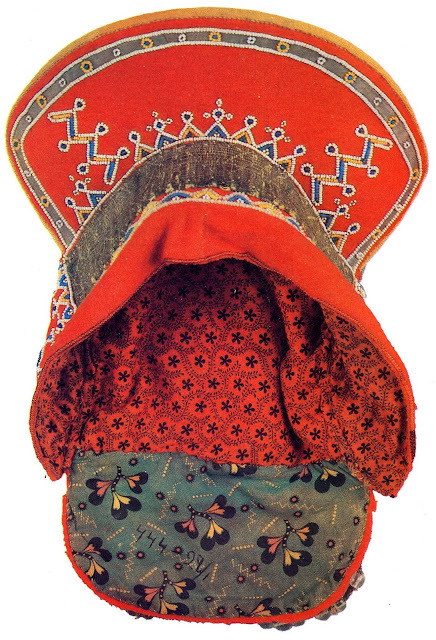 Picture 28, said to depict a Jukkasjärvi gakkti is actually not a sami garment. The woman in the picture is wearing a shirt that is part of what she calls an artproject. I'm not sure what kind of point she was trying to make using sami patterns and handicraft, mixing them up, and making these objects out of plastic and other non-traditional materials. Maybe she just wants to demonstrate that nothing belong to the sami, you can strip them of their land, deny them their rights and also hijack their culture and capitalize on it. It's really quite more difficult to find information on the sami from Sweden than from Norway and Finland. I found a few pictures, but I see that you have found some on your own! She's even wearing the traditional hat! Here are two links to pages with additional pictures if you are intrested. Thank you for an ambitious, educational and inspirational blog!!! Thank you very much. I am always glad of more reliable information. Also, differentiating between "sweden" and "norway" often doesnt make sense, seeing how cultural areas exists irregardles of political borders. Several areas have the same/similar gakti on both sides of the border, simply because it is the same "area" culturally. 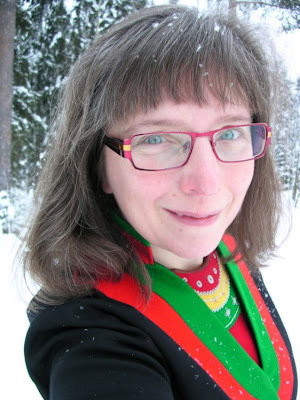 That artist is Lisa Vipola, and the fault we find with her is not that she admires Sámi handicraft, but that she is degrading it by claiming what she makes is authentically Sámi, when in fact she is not Sámi at all. She has co-opted our culture and is now claiming that she's "coming out" as a Sámi woman, as if you can choose whether to belong to an ethnic group at will. Please source and date your photos if you are going to claim being a researcher of some kind. Otherwise this nice collection has little use. 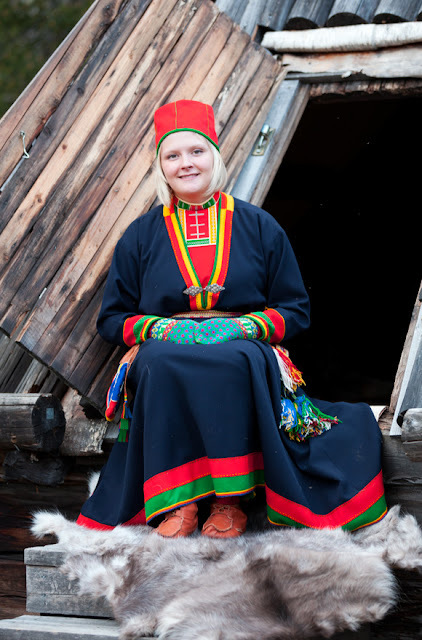 Do you know how the Saami make their fabric and dye it? I believe that they have always bought it from their nieghbors, as they do not raise wool. It would seem that the wool was bought as trade goods. The fur for the outer garments they have always provided for themselves. Roman, we have raised sheep since the 1300's. We produce our own wool, and we made our own cloth (i think its called "felt" in english? Norwegian name is "vadmel") from it, before imported cloth from england became available. Oh, and the colors traditionally were produced naturally, with palnts and fungi. Thank you for that information. It is not 'felt', however, as felt is not woven. The term baize is sometimes used, but there is no good English word that would be understood to mean this type of homewoven wool cloth. Thank you so much, Roman, for your information and photos. How wonderful that people other than ethnic Saamis are interested in the clothing and culture. I believe people outside the culture can recreate an outfit as best they can, and wear it with pride and respect. Thanks again. Your opinion does not reflect the attitude of the majority of samis. We concider it highly offensive when non-sami people dress up as samis. 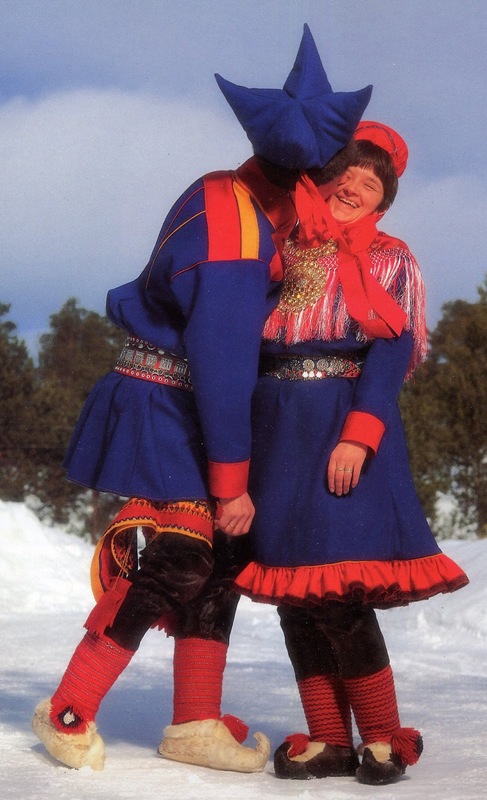 (In scandinavia, it is STILL a comedy trope to dress someone as a "sami", and portray him as a drunken fool). Thank you for this information. As an American whose great grandparents came here from Finland and are no longer living, it is always a pleasure to learn more about our heritage. Traditional dress is one way I feel can bring a closeness with the past and our ancestors. While others celebrate with their kilts and dirndls, it brings pride that I am able to share the great people I come from. My maternal grandparents came from Finland around the beginning of the last century. If you want, and if the blog owner is in agreement, perhaps he can pass along my email address to you. There are some wonderful records available through the Finnish HisKi search engine. Looking forward to hearing from you. 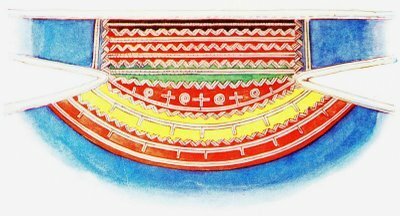 Thank you for your blog and interest in the origins of Saami culture. If it weren't for those with interest, whether Saami descendant or not, our origins may have been even more lost to "Norwegianization". For a family reunion in 2004, I made a Troms gakti (kofte) using pictures from the internet. 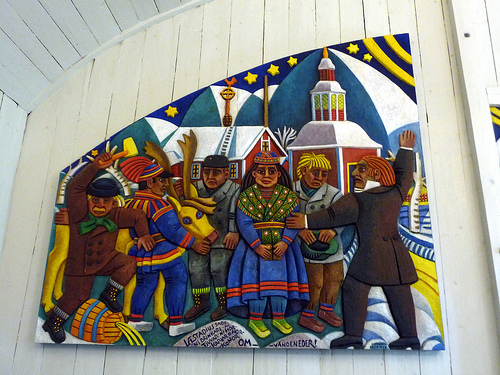 Back then there was not much to be found, other than a single picture of an Ullsfjord Troms kofte (to honor my great-grandmother Bolette Olsdatter from Sørfjord, Ullsfjord) displayed in a Tromsø museum; and other pix from here: URL: Lailas' site also has many pages of 'bunad' pictures from all over Norway. Though my gakti and komagen are not truly authentic, they are made as close to the craftsmanship that my ancestors might have employed, while incorporating my own design influence, and love. My credentials? 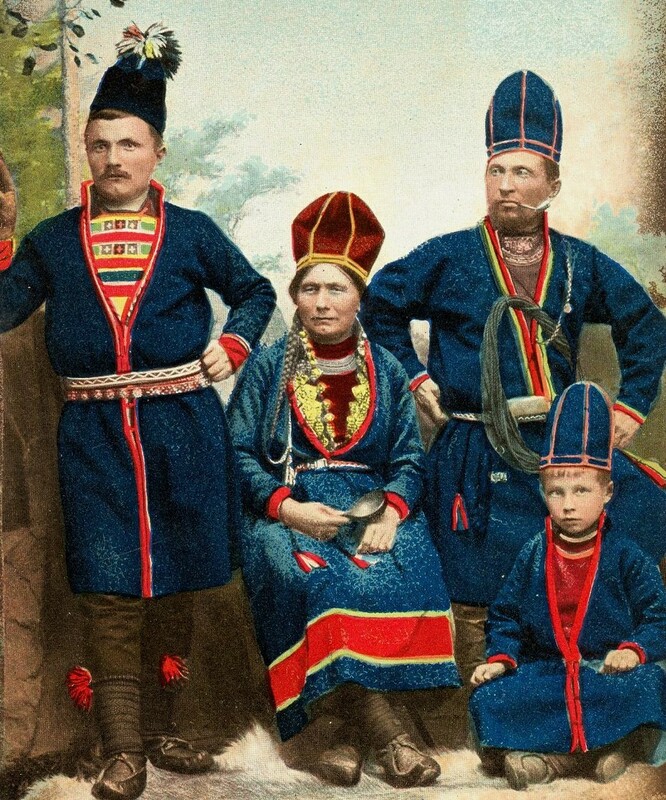 Three out of four of my paternal great-grandparents were Saami. The fourth was most likely to have been partially Saami. By 1839, my ancestors had lived in Troms (Finmarken) for about five generations. Lots of neat 'bunad' pictures. Also Roman, your web page would not let me 'sign out' as Christine, without including a URL, which I do not have. So I am 'Anonymous'. I agree with this post if you are not Sami you have no right to pretend you are this would be no different than a non Native American dressing in native attire. My GG grandmother was Sami so I take this as a personal insult. If you are culturally lost take time to discover your own ethnic roots an represent who you truely are do not steal the culture of another group just so you can follow the latest popular fad. 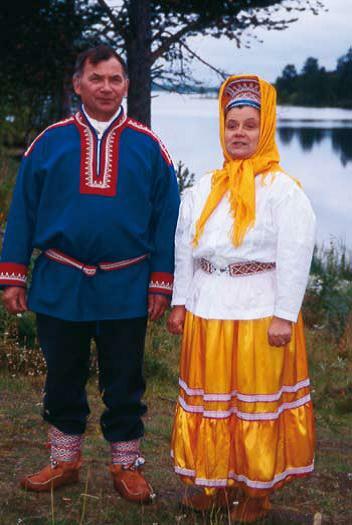 My grandparents were both Saami, I am the third the generation in the US. My grandparents and my parents (passed while I was young) I have lost all my Sammi heritage. How in the world would I know what pattern to make to represent my family when they are dead? I am extremely upset with people who are angry and think everyone's heart is in a malicious place. If anything it draws attention to the Sammi culture and it encourages global attention from all the first nations. If you don't think that helps best think otherwise. I have always supported my local Anishinaabe people. They share their culture, their clothing and they teach with a warm embrace. They offer classes so you can make your own pucker moccasins, baskets, bead work etc. This is how you cross the borders of understanding and teaching respect. We are all one people in the end..shame on you for discouraging knowledge. An explanation in a kind way instead of attacking people with good intentions makes morale sense. I am sorry to say that your blood or genes does not alone make you sami. If so, there would be around a million sami people in scandinavia alone. 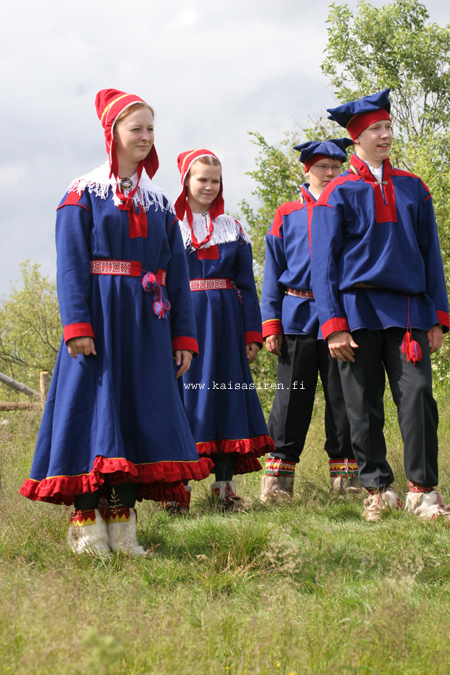 If you arent raised in a sami culture, how can you understand us? Anishinaabe might teach their craft to outsiders, but we are Sami, not Anishinaabe. All of humanity is one family, but our culture is our own. It has been stolen, oppressed, ridiculed and persecuted from christianity arrived and continues to this day. We fight every day to survive as a people. 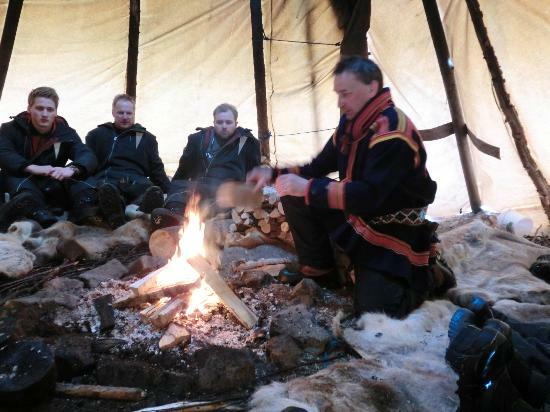 If you want to reconnect with a sami heritage, visit sapmi! If you want to make a gakti, do it properly! Doudji is an art-form that requries a high degree of skill, bad handiwork is concidered shamefull. My grandmother would check the inside seems of garments my mother made, to check that it was perfect even where it doesnt show. 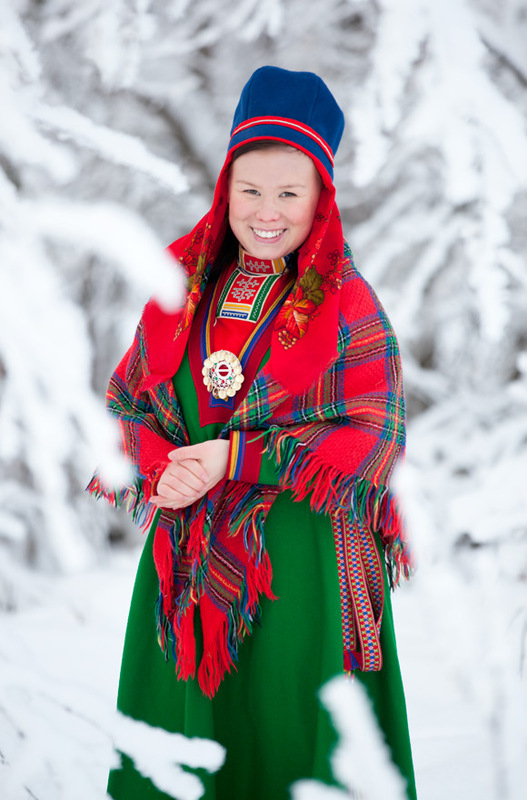 We sami people take a lot of pride in our heritage and culture, even though there is a lot of mocery. 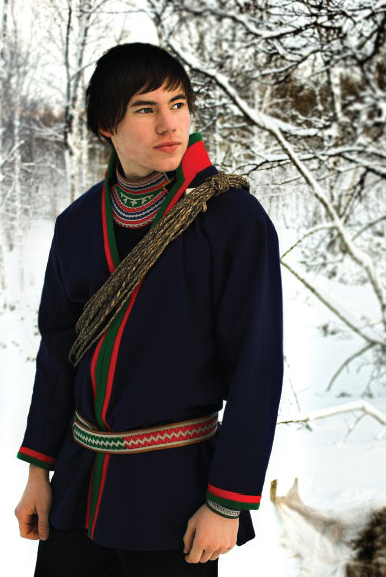 Many sami people hide their heritage and are ashamed of it. We live in countries that have tried to eradicate us, they have stolen our land, our language and for a lot of us, our pride in our selves. -sami languages adjacent to each other are mutually intelligble, especially if both speakers are somewhat familiar with each others language. -differentiating along nationstate-borders makes no sense, because our cultural areas doesnt care about lines on a map. We were here before the lines were drawn. :P What I mean is that a cultural area might exist on both sides of a border, thus wearing the same gakti. -Inari sami also exists in norway. - we take great offence in cultural appropriation. 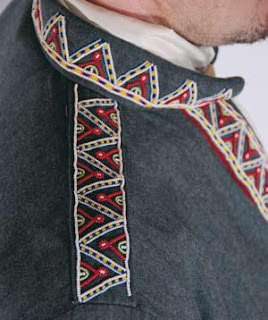 -If you have to buy your gakti from a sami seamstress, it will be expensive! Its quality handiwork, labor intensive and demands a lot of skill. Just the "tunic" part of a mans gakti would cost from 1300$ or more (and thats only if you happen to be from an area where the tunic is really "minimalist"). A complete summer gakti of the simplest kind would be around 2500$, then you add the accessories... So with the silk and the silver/gold, knives, pouches etc, we're easily at 5000$. Lets say you wanted to show off your wealth and needed a really fancy gakti (for marriages etc): Easily 10000$ (But then you are wearing probably hundreds of hour of work). If you wanted a complete set of traditional clothes for all seasons/weather... I really don't know. There is probably not a single sami alive who could afford to flat out just buy it all. 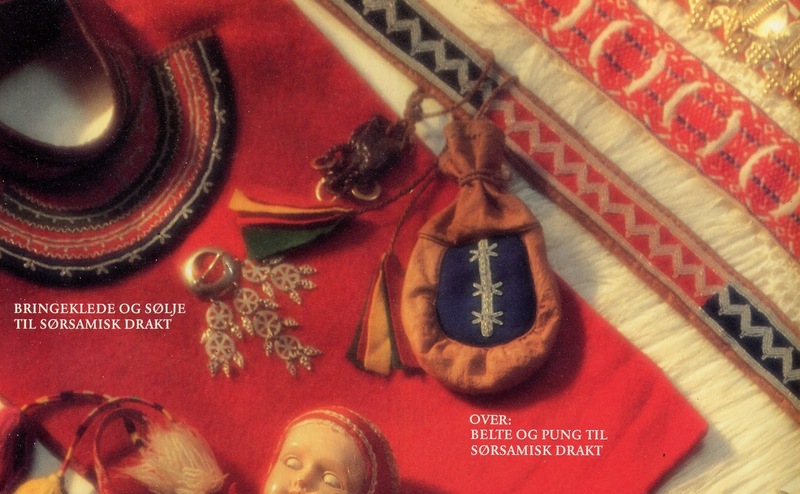 Most sami get their stuff from relatives: the jewelry are inherited through generations, clothes are made by relatives etc. The Saami seem to be very angry nowadays and perhaps for a reason. But still you should not take it out on people who are interested in your culture. How could they know about these things being offensive to you? I for one don't know any other culture, indigenous or otherwise, who would be offended when someone draws inspiration from their culture. 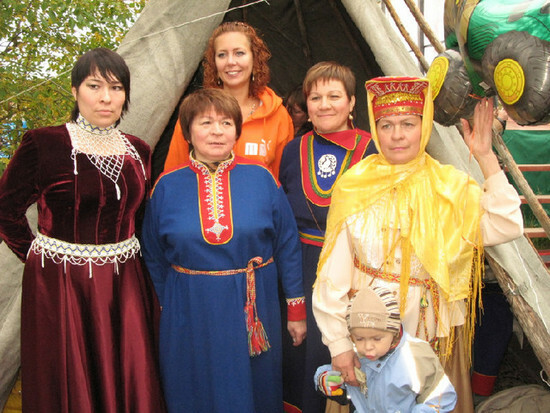 The Saami in Finland want the ILO169 contract ratified. Fine, I want that for them too and most Finns I know. It might help to get people interested in the culture so they would help with this cause as we don't really know much about Saami and their situation here in southern Finland. The only times we hear from them are when they are again enraged about an artpiece, a Disney film or that a wrong person identifies as Saami. You don't get friends with that behavior. You seem very angry about this. If you are only hearing us when we're misrepresented by outsiders, you're just not listening hard enough. Perhaps you dont undetstand what the sami are saying. They and their culture have been subjected to genocide and theft for hundreds of years. Your feelings may be hurt but they and their ancestors have been killed, raped, imprisoned and poisoned for generations. Now you are coming for their clothing. Your feecomingbeing hurt by their words do t matter. Have some rezpect. They dont owe you anything. Thanks for putting all this together - it's very informative! Could you add pictures of the Gällivare style? It's where I live, & what I was looking for when I found your blog. As an American with approximately 75% Saami heritage, my interest in this part of me has only grown and grown while living in Finland and learning its language. I would love to make a kirtle for myself as another step in learning more of my heritage, but as it would be offensive, I must only dream. My story is similar to Reidun. My great grandmother confessed in shame on her deathbed (in rural Minnesota) that her family were 'gypsies'. She had come to America through Norway. Further research by family members proved that she was Saami but because of her shame we were unable to find out more. She did not pass her culture on. However, when our research verified her confession, my heart sang. I understood why I wished to live out of doors, and many other parts of of my made sense. Then I had a dream in which a man walked down the street of my neighborhood. When I saw him I became curious about the way he was dressed. He was very old and very wrinkled, and his eyes sparkled as he looked at me. He stopped and said, 'I am Saami.' My heart literally leapt in my chest at his words and his smile became more broad. "Yes,' he said, "you are Saami too.' Then he went on his way. That dream was at least twenty years ago and it still moves me to tears to this day. 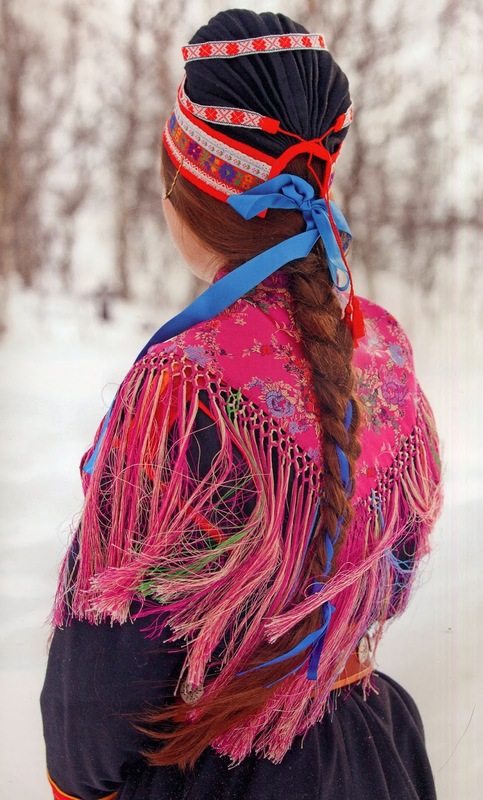 So although I was not raised as Saami, and only know from what I have read, and do not know my place in Sapmi, my dream is to know everything and to return to the home of my ancestors. I have warned my children, if I am able to someday make this trip, I may not return. Your post brought me to tears. 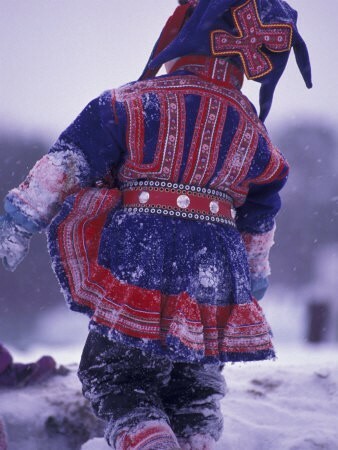 With so small a population please don't let those of Saami spirit go. You are in us and we are a part of you. Beautiful dresses and costumes. 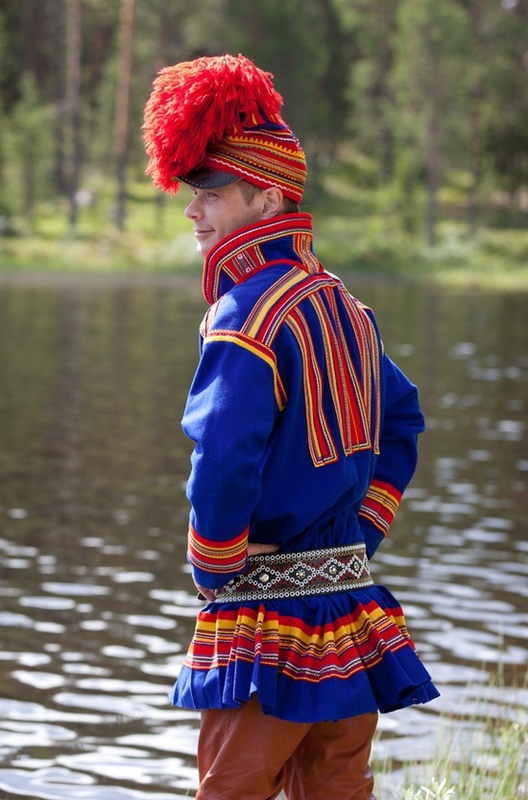 I love the Saami costume styles. All the pictures are expressive and good. Thanks for this beautiful collection. The "young man is also South Saami from Sweden, from around AmmarnäsTärnaby, VilhelminaÅsele", who is he? I think we must be related, he look 99% like my son. 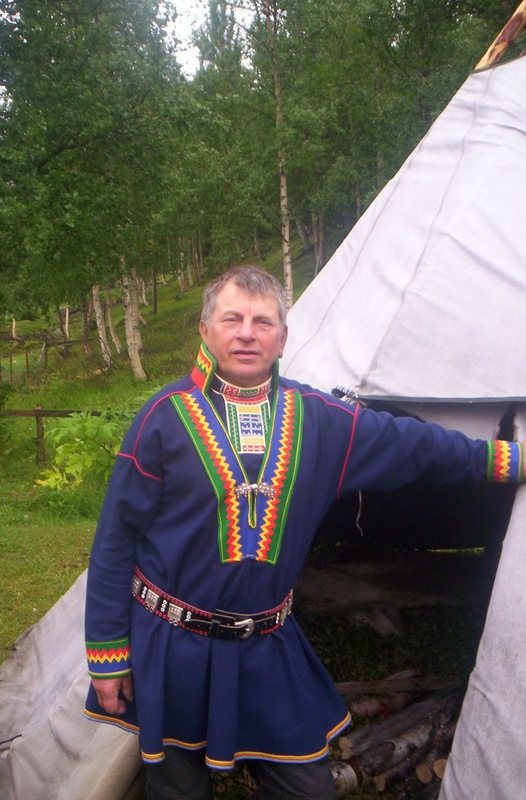 My grandfather is sami, but i never knew him. 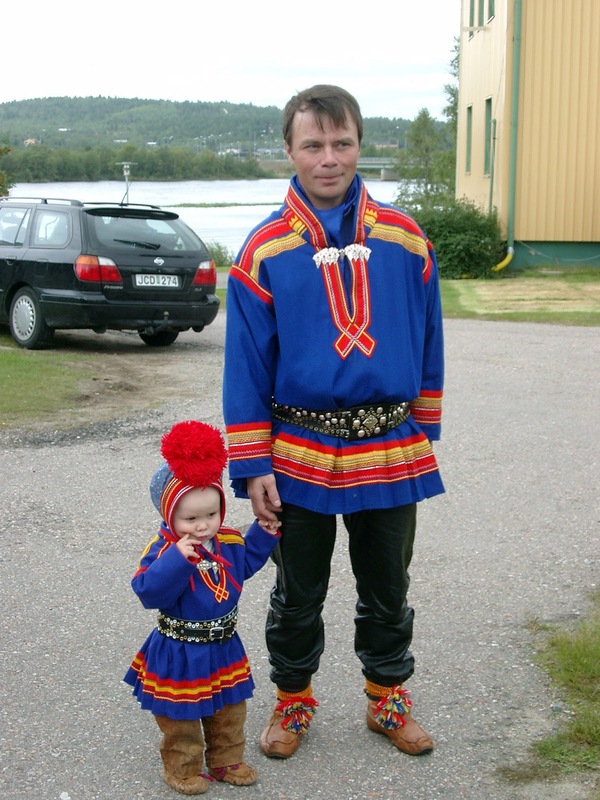 I am also interested in where to buy a traditional sami dress for my daughter. Do you make them or know where I could buy one? Thank tou! I grew up knowing my mother's mother side of the family was Finnish, and I later learned my father's father's side was as well. In fact, DNA testing reveals that both strands of my family story trace back to the Saami people. I am curious to know if it would be considered offensive by modern-day Saami for me to pursue obtaining the art, jewelry and clothing of the culture? I feel a strong affinity to it, but at the same time am sympathetic to some of the views I've seen expressed here. Any thoughts? Thank you. I like this kind of traditional dress. Shree designer saree is a one-stop online shopping website that caters the needs of bride, groom and everyone involved in Indian wedding. Experts in sarees, wedding sarees, lehengas choli, gowns, salwar kameez. Fast delivery in USA, UK & world wide.